I think I own more feed scoops than anyone. They are like my reading glasses; I can never find one when I need it. I tried making one of these feed scoops and it is as easy as it looks. 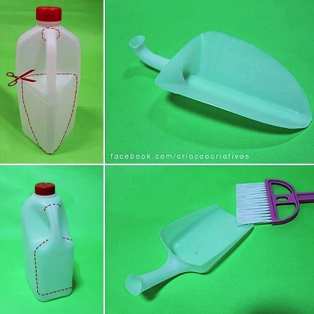 Start saving those plastic jugs and putting them to good use. I have a giant list of friends and family who will be getting one of these for Christmas. I think I'll start with the first homemade gift going to my mother-in-law. I think I'll build her a dust pan.